WELCOME PACKETS ARE LOCATED IN THE FRONT OF THE CHURCH. 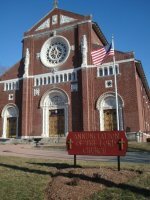 Welcome to the Annunciation of the Lord Parish. I wish to extend a warm welcome to our new parishioners. I am delighted that you have chosen to worship with us and very much hope that you will feel at home here. One exceptional part of belonging to Annunciation of the Lord Parish is feeling that we're a part of something much larger than any one person. Our church connects us all - as neighbors, as a community, as children of God and followers of Christ. Please take a moment to complete our parish registration form and then either mail it to the parish office or return via the collection baskets. Your registration is the official way to join our parish community. It is a commitment to a community, a way to be included in the religious, social and ministerial activities of our parish. Also included in this packet, you will find a copy of our church weekly bulletin, informing you of important contact numbers such as the parish office, our e-mail address and website, the parish staff, daily mass schedule, faith formation classes, etc. You'll also see in the bulletin, exciting new events upcoming in the weeks and months ahead. And, lastly, some quick facts about Our Lady of Lourdes School located just down the street from our church. Again I welcome you into our parish. If I can help you in anyway in the transition into our parish community, please contact me at 508-823-2521. Why is it so important that we register in a parish? Isn't it good enough that we go to Mass? Why should we bother to use the envelopes? Registration is the official way we join a parish community. Many people think that because they attend a particular parish they automatically belong. At times young adults who have moved away for years think they are still signed up under their parent’s registration. But membership requires signing up, formally enrolling yourself in a parish. Registration is a commitment to a community, a way to be included in the religious, social and ministerial activities of your parish. Your registration affects the parish in many ways. Census numbers can determine how many priests are assigned to a church, what benefits and obligations the community has to the diocese, and how Masses, confessions and devotions are planned and scheduled. Registration shows you belong. It is also necessary for certain benefits, like scheduling sacraments, obtaining sponsor certificates, and getting donation statements for taxes. Registering in your parish is a statement of faith and confidence in the life and work of your parish. Our parish produces and mails 870 envelopes to member households, costing approximately 60 cents to mail to each household per batch. On average the parish receives between 250 – 300 envelopes returned in the weekly collection. Using the envelope system is one way that a parish can verify your participation in weekly Mass should you request a sponsor certificate. If you are receiving envelopes and do not wish to do so, please contact the office and we will remove you from the mailings. This will save the parish money on this expense. If you are receiving envelopes but not using them, please consider doing this.